What do I after a bike crash? After the shock of the crash wears off, this is the question we all end up asking. Getting injured in a bike accident is a traumatic experience both physically and emotionally. No one is ever prepared for when the unexpected occurs. Many bicyclists who have been in a bike crash feel a sense that "everything happened so fast" and in the moments after it is unclear what to do. 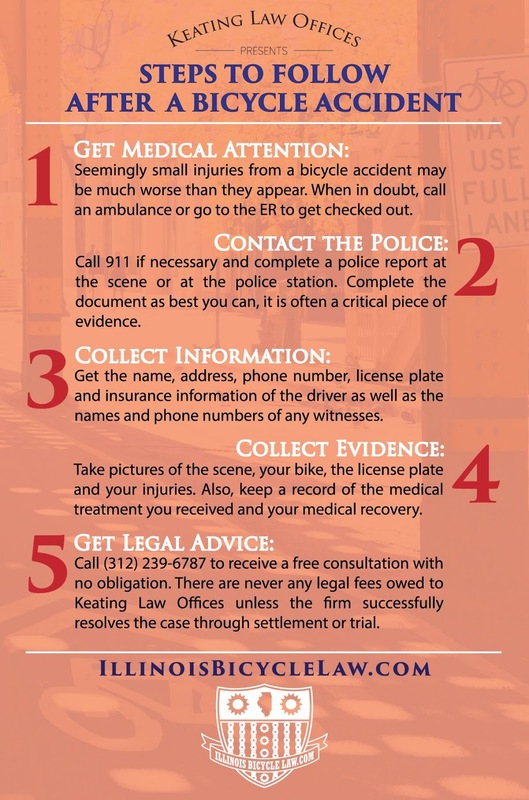 As attorneys who fight for bicyclists, and bicyclists ourselves, we have outlined the 5 Steps To Follow After A Bicycle Accident. Each bike accident is unique, but following these steps will help provide some direction in your path to recovery. 1. Get Medical Attention: This can not be overstated. The most important thing to do after a bicycle accident is to "take care of yourself first." When in doubt, call an ambulance or go to the ER. Seemingly small injuries from a bike accident may be much worse than they appear. It is also better to be safe than sorry. If you are concerned about the cost of an ambulance or emergency care, there is most often insurance through the driver that caused the crash, health insurance, public aid and charitable options for medical bills. Severe injuries that do not receive immediate treatment can become much worse very quickly. 2. Contact the Police: Call 911 if necessary and complete a police report at the scene or the police station. You can also walk into any police station and report a bicycle crash. The police report is often a critical piece of evidence in a lawsuit or insurance claim from a bicycle accident. It is important that your version of events get included in the police report. 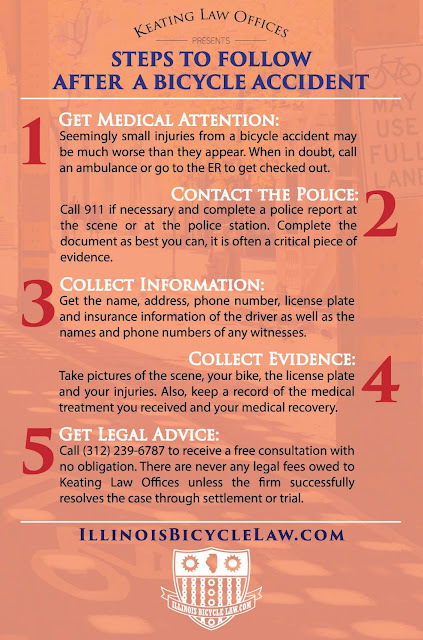 Even if you had to leave the scene to get immediate medical attention, you can always contact the local police department and give your version of events. 3. Collect Information: Get the name, address, phone number and license plate of the driver. If possible also get the insurance information from the driver. Illinois law provides that all drivers must have auto insurance. Also try and get names and phone numbers or e-mail addresses of any witnesses. Most people who witness are bike crash are willing to help, but you need to know how to reach them. 4. Collect Evidence: Modern smart phones are invaluable in documenting evidence from a bicycle crash. Get digital pictures of the scene, your bike, and your injuries. You can also take a quick video of the scene. A quick photo is also an easy way to get a copy of the driver's license, their insurance card, and their license plate. Also keep a record of the medical treatment you received and your medical recovery. 5. 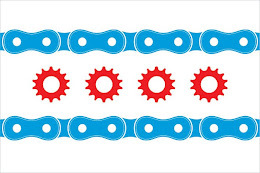 Get Legal Advice: Keating Law Offices is committed to providing an initial legal consultation to any bicyclist injured anywhere in Illinois at any time. Keating Law Offices always provides free initial consultations with absolutely no obligation. We can even come meet you if necessary. Know that there are never any attorneys fees unless we settle or win a case. And many cases from a bike accident can be resolved in the injured bicyclist's best interest without going to court. It is important that you pursue your rights under the law. All calls and emails are returned as soon as possible and always within the same day! You can also "Chat Live" with our online operators regarding your case at any time day or night. Our attorneys are licensed in all of Illinois and we are ready to represent any victim of a bicycle accident who was injured through no fault of their own anywhere in Illinois at any time. Our commitment to victims of bicycle accidents is unwavering. The Illinois Bicycle Lawyers at Keating Law Offices have successfully represented victims of bicycle accidents throughout Illinois. We are based in Chicago, Illinois but routinely handle cases in not only Cook County, but DuPage County, Lake County, Will County, Kendall County, Winnebago County, Rock Island County, Sangamon County, Champaign County and the remainder of Downstate Illinois.